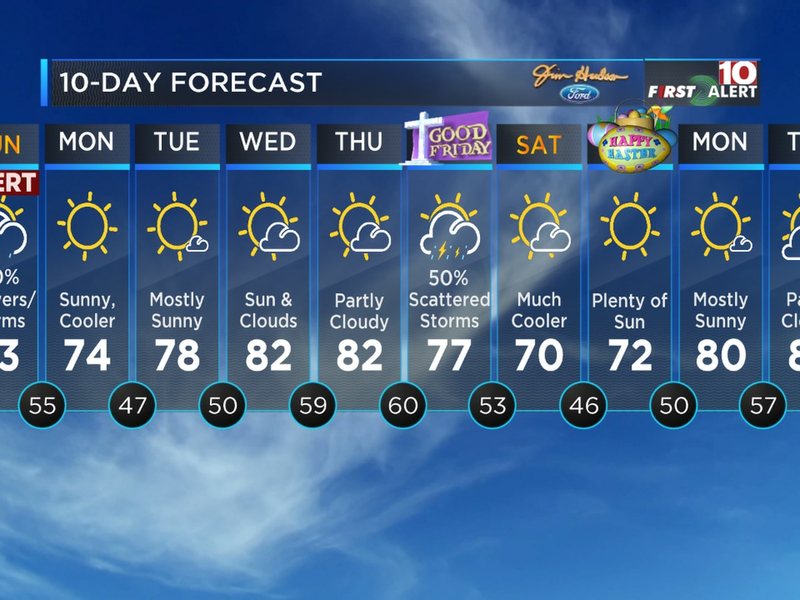 COLUMBIA, SC (WIS) - Enjoy the dry weather while it lasts. 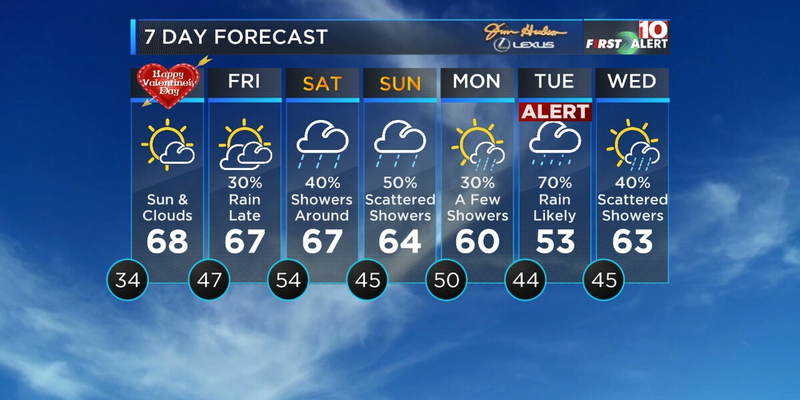 We’re tracking more rain for your weekend, along with an Alert Day for Tuesday. · Valentine’s Day will bring mostly sunny to partly cloudy skies. Highs will be in the 60s. · More rain moves in late Friday through Sunday. We’ll likely see periods of light rain through the Midlands. 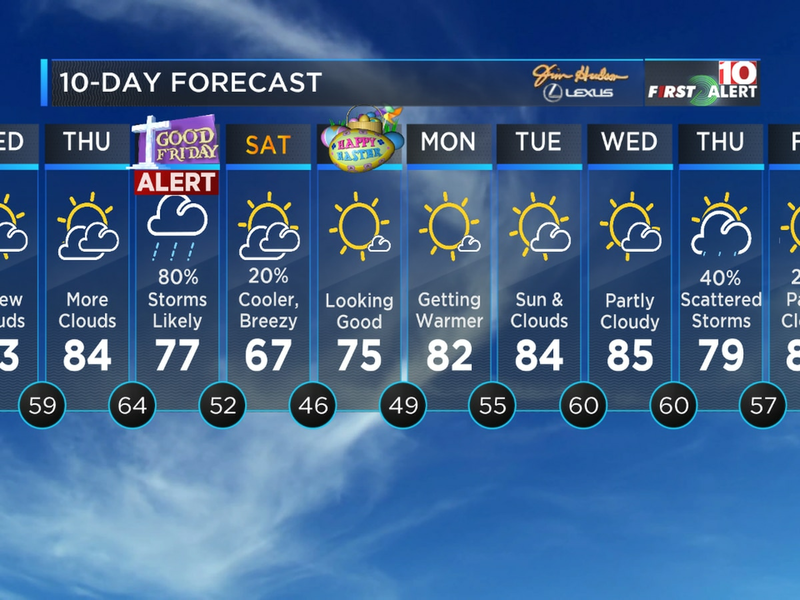 · A few showers are possible Monday. Highs will be near 60. · Tuesday is an Alert Day. 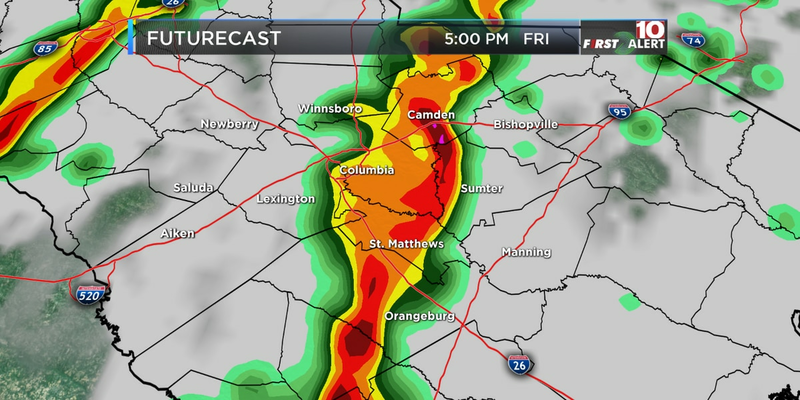 A weather system will bring periods of heavy rain to the viewing area. Localized flooding is possible. Highs will be in the lower 50s. Temperatures will drop into the mid 30s by Thursday morning. Valentine’s Day will be great! We’re expecting mostly sunny to partly cloudy skies. Clouds will also be around by the evening, but no rain is in the forecast. Highs will be in the upper 60s. A cold front will move into the area late Friday into Saturday, giving way to scattered light rain. With the front near the area Sunday, the chance for rain will continue. Rain chances are around 50% on Sunday. Otherwise, we’ll see mostly cloudy skies Saturday and Sunday. Highs will be in the mid 60s. A few showers are possible Monday. Rain chances are around 30%. Those rain chances will grow to 70% on Tuesday as another weather system pushes in. This time, the rain could be heavy. That’s why we’ve issued an Alert Day for Tuesday. Some localized flooding is possible. It’s too early to tell whether or not we’ll have thunderstorms, but we’ll keep an eye on the forecast for you. Highs will be near 60 Monday, then fall into the lower 50s Tuesday. Valentine’s Day: Sun and Clouds. Mild. Highs in the upper 60s. Winds: SW/S 5-10 mph. Friday: Mostly Cloudy. Showers Possible Late (30%). Highs in the mid to upper 60s. Winds: SW 5-10 mph. Saturday: Mostly Cloudy. Scattered Showers (40%). Highs in the mid to upper 60s.